Play Typer Shark Deluxe as your typing tutor, the new version of Typer Shark Game Hone your typing skill in Typing Tutor mode, The best TyperShark game for you. Typer Shark Deluxe - TyperShark Game Move over, Mavis Beacon, it's the typing game tutor with teeth! Zap sharks and piranha as you dive for sunken treasure! Now you can play this typing game on your PC any time you want, whether or not you're online, play funny typing game as your typing tutor to hone your touch typing skill, just try it! Typer Shark not only a funny typing game but also a typing tutor! Typer Shark - hone your typing skills in Typing Tutor mode! Typer Shark - unlock the secrets of Adventure mode! Typer Shark - with new graphics and sound now ! Typer Shark - add new mode, dive deep into the Abyss! Typer Shark - record high scores for posterity! Typer Shark - add new enemies and deadly 'boss monsters' to defeat! Seven Seas for Windows - Play the awesome new version of this action puzzler! new Seven Seas Game for you ! 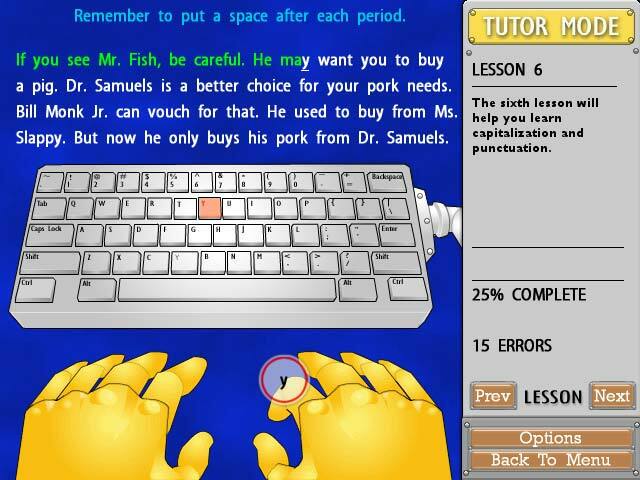 GS Typing Tutor - A powerful and full features Typing Skill, Typing Practice, Typing tutor software which could help you to learn keyboard typing skill, develop your typing skills and test your typing speed, all of these could be done with an amusing and pleasant way.